Owning a static holiday home or luxury lodge is a lifestyle choice. It’s your second home in a location of your choice where you can escape to and unwind any time you and your family please. Morris Leisure is proud to own four luxury holiday home parks, all in picturesque parkland settings and conveniently located to the nearest town and village. Interested in buying a holiday home? Few locations in the UK can match the magnificent backdrop offered by Bow House Country Park, located in the peaceful and tranquil South Shropshire countryside. It will come as no surprise that the glorious countryside that surrounds this luxury caravan holiday home park is officially listed as an Area of Outstanding Natural Beauty. Bow House Country Park is a wonderful place to get away from the stresses and strains of modern living, an idyllic, secluded location for your holiday retreat. Shropshire offers the perfect base to establish your second home, which can be used for weekends, short breaks or regular refreshing holidays for you and your family. 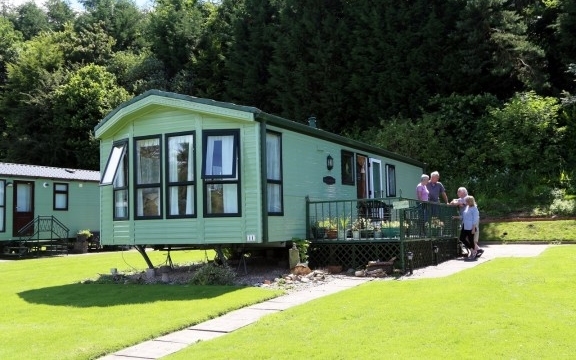 Caravan holiday home owners enjoy the best of both worlds at Oxon Pool Holiday Home Park. The beautifully landscaped park takes advantage of an attractive countryside setting yet it's conveniently located close to Shrewsbury town centre and the road network to Mid and North Wales. If you had to choose the perfect location in the Welsh countryside for your second home, then the lovely village of Betws-y-Coed would surely be close to the top of your wish list. As the name suggests, the five star Riverside Holiday Home Park enjoys a riverside setting within walking distance of the village shops, restaurants and pubs, yet offers peace and tranquility to those seeking escape and relaxation. Ludlow’s luxury static holiday home development welcomes couples and families looking for a tranquil retreat. It is a place to enjoy your holidays and create those everlasting memories. As a development of the existing holiday park, static caravan owners can benefit from the quality on-site facilities including the shop, full-site security, laundry room, playpark and secured dog walk. Another bonus is the regular bus service from the park calling in to Ludlow and Leominster with connecting services to Hereford and other areas of Shropshire. After years in the business, we understand that our customers are looking for five star facilities in a peaceful location. That’s why you won’t find a clubhouse on our parks. Instead you can sit back, relax and soak up the stunning scenery and tranquillity.